In the previous VIPM tutorials, we have covered how to create a package, how to create a palette, and how to add examples, help files, and tools menu items to our package with VI Package Manager. Now that we have this package ready, we want to add an end-user license agreement (EULA) to our package that users must accept before installing. 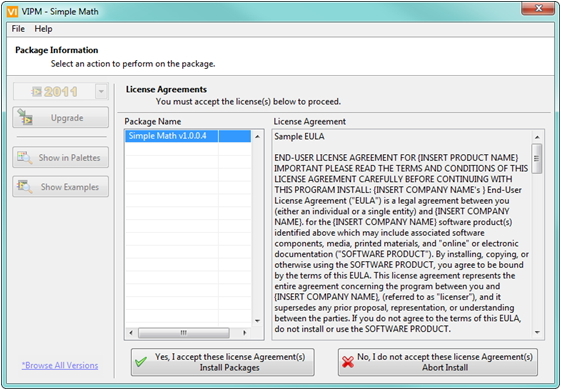 License agreements are used for both paid and free software. VIPM enables you to reference a common license, like the BSD license, or include your own custom license. We are going to choose a custom license file that is saved as a plain text (.txt) file on disk. Open the Package Builder if not already open. Select the Display Information category. License Agreement Text File Location – Here you can include your License Agreement as a plain text file (.txt). This will be displayed to the user before they complete the installation of your package. Click the browse button to the right of License Agreement Text File Location. After completing the two License Agreement fields, build the package by clicking Build Package. After the build finishes, click Open Package in VIPM Main Window. VIPM now installs the package as normal. Click here to go back to the table of contents, or continue to learn about custom installation options in VIPM. Is this feature of the Professional version in VIPM 2012? Jonathon - The License Agreement feature is part of VIPM Free Edition. It's probably just easily overlooked because it's tucked in with all the other fields on the Display Information tab.